Iranian President Hassan Rouhani (R) and Foreign Minister Mohammad Javad Zarif (L) during a ceremony in Tehran, Iran, on July 22, 2018. Tehran : The President of Iran on Sunday warned the US against pursuing conflict with his country. Hassan Rouhani asserted that his country was not seeking to start hostilities with the US, but said it would not shy away from a fight, reports Efe news. “(Iran’s) enemies must understand well that war with Iran is the mother of all wars, and peace with Iran is the mother of all peace,” Rouhani said, speaking at a ceremony attended by Iranian diplomats. The Iranian leader warned US President Donald Trump “Do not play with the lion’s tail; you will regret it,” and emphasized that Tehran “will respond threat with threat,” as quoted on the website of the Iranian presidency. In May, Trump pulled the US out of the 2015 multilateral nuclear agreement with Iran and once again imposed sanctions on Tehran, which will come into force in Aug. 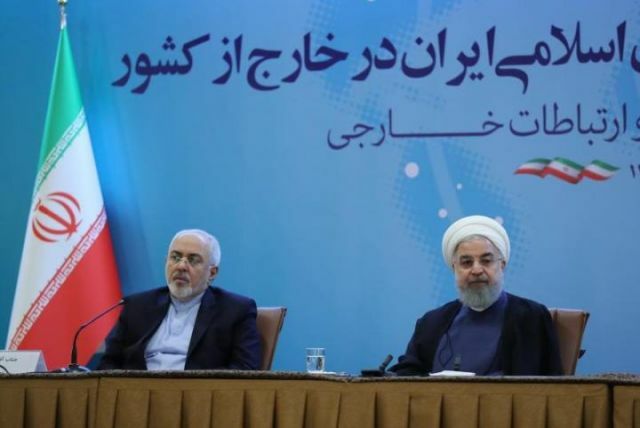 In his speech, Rohani also said “You can’t incite Iranian people against Iran’s security,” alluding to statements made by numerous US officials to encourage internal protest movements against the Iranian government. The 2015 nuclear agreement, signed by Iran and the 5+1 Group (the US, Russia, China, the UK, France and Germany), limits Tehran’s nuclear energy program in exchange for the lifting of international sanctions, but its future has been thrown in doubt after Trump’s return to a more confrontational stance. The Ultimate Muslim Woman Clapback to Trump: #CanYouHearUsNow?